Why British Choppers Are Making Their Mark In The United States: Americans are used to seeing their varying styles of choppers and bobbers, but there are other varieties that many of us never see, or even know exist for that matter. British bobbers and choppers have their own style and design created with that British edge (would you expect anything else from those Brits?). British Choppers, which are pretty much synonymous with a bobber in Britain (a bobber is a slightly different variation on the chopper design because of the angle on the steering rake, bobbed rear fender, and front fender being removed completely, and other parts that aren't absolutely necessary to the main function of the bike etc.). Chopped Brit bikes have a unique design and feel to them which makes them a much sought after bike amongst some motorcycle enthusiasts. I know, purists say, "Choppers are bobbers, they just have less stuff on them." And then there is the other side of the argument where some purists say, "Bobbers are not choppers. Bobbers came before the chopper, and they are totally different". True British choppers are bikes that have been chopped and changed to a chopper style, although enthusiasts like to take any British bike and chop it there is one particular brand that stands out as a favorite. 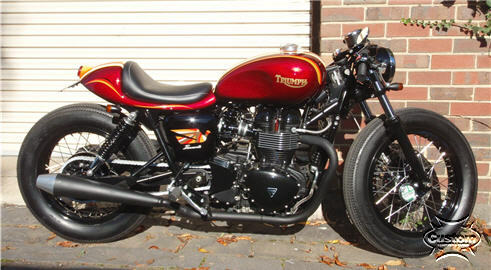 The Triumph motorcycle is the most popular British brand, and makes a killer chopper or bobber project. Triumph motorcycles, built in Hinckley, Leicestershire right in the heart of England and has long been synonymous with being the true British bike and has long been a favorite among British bike enthusiasts looking for a bike to chop to create a true British Chopper. The other two brands that you'll find that can make great chopper projects are Birmingham Small Arms Company (BSA) bikes, and Norton Motorcycles. Old BSA bikes restored to their original condition are also desirable long term projects. The final result can be something to relish, and you might find a buyer who will pay big money. Same with older Norton bikes. But nothing is stopping a bike builder from building a British bike out of old BSA and Norton bikes. You won't find many of them because it's much easier to find a Triumph chassis, parts, or a complete bike for relatively low cost. Whereas a BSA or Norton is harder to come by for a bargain. Norton's (and Triumphs) were part of the evolution of the Cafe Racer in Europe. Cafe Racers were really the European equivalent of bobbers and choppers in the USA. The reason for the differences are because Europeans preferred the higher more agile feel to their bikes to handle the windy roads in Europe. While Americans preferred a lower more comfortable style. In my opinion it would be a shame to chop up a new Norton because they are handmade, and the are gorgeous machines. Not to mention they are really expensive. 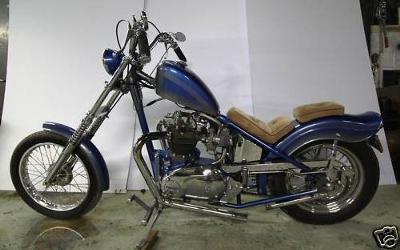 However you can find an older model and make a British chopper out it, or restore it to it's roots are a Cafe Racer. One of the most common and notable things about British bikes is the motor used, there are really only two types of motor used in a real British Bike. The two types of motor's used are either Triumph or BSA, some have started moving towards Japanese motors which takes away from the true British look and feel. When looking at a Brit Chopper you can see straight away the distinctive stretched frame that provides a low riding position. Other notable features are that they retain an old world feel as many British motorcycle enthusiasts try to revive the bikes of old by utilizing old parts to make their projects unique, have a story behind them, and really bring their bikes to life. Many British Choppers have a weld on hard tail frame; this is unless a custom frame has been chosen for the bike. As well as the aesthetic beauty of a British Chopper another good reason why people turn to this eye pleasing beauties is because they can be built on a budget if you know what you are looking for. Many motorbike enthusiasts are known to scour scrap yards and the online world looking for old bike parts that would fit nicely into the criteria of the British Chopper design, this is because of the items low cost to purchase. The only real cost comes in the form of the bikes motor, again this can also be found at low prices when found in the right environment. As a result of being able to find parts for very little money (mostly Triumph motorcycles), and the fairly high resale value of some of these project bikes, British bobbers and choppers are making a dent in the biker community. And they love their bikes with a passion, as well they should. The British chopper is more than a motorcycle; it is actually a way of life for those that own one. British Choppers are also fun to ride and are a real head turner as many people hear you coming then bask in the glory of your bike as you ride by. If you have a BSA or Norton Cafe Racer, bobber, or Brit chopper please send us pictures with details. We would love to get your story up here!